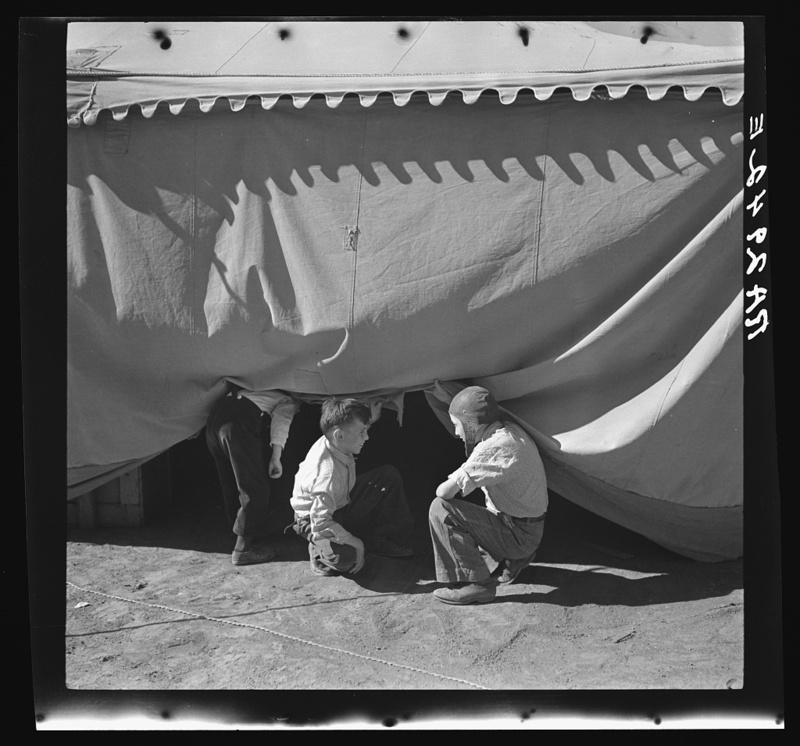 Boys sneaking under a circus tent in Roswell, New Mexico in 1936. The big tent show was scheduled for Sunday, August 17. But on Saturday the performers were treated to a free day—time to relax and enjoy the local sights before the big show. One group headed to the woods for a picnic; others took an automobile ride in the country. Another party enjoyed a “Mulligan” by the river. 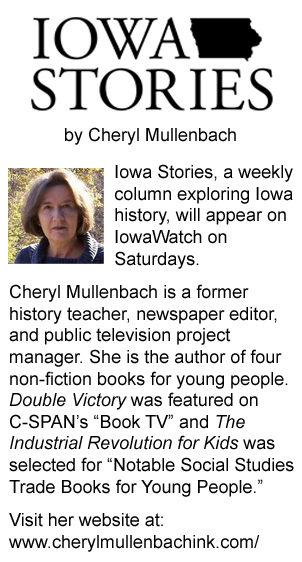 (Typically a Mulligan consisted of a clambake, but the Marshalltown version included a vegetable bake—with fresh Iowa sweetcorn.) The equestrian director and his wife—one of the equestriennes—chaperoned a group of 24 on a fishing trip to Stanley Mill. Checkers was a favorite pastime for some of the performers who chose to stay on the circus grounds. A group of clowns shed their makeup and costumes and pitched horseshoes. 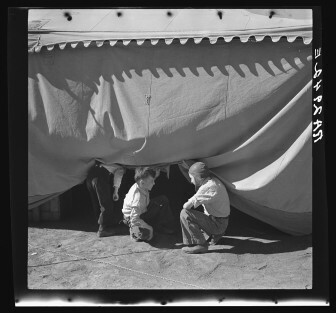 While the performers enjoyed their free day, other circus workers spent the day before the big show preparing for the arrival of thousands of guests, shopping for gargantuan amounts of food and tending to the wild animals. It was not a free day for them. The cooks who traveled with Barnum & Bailey spent their two-day stay in Marshalltown preparing meals. Fifteen hundred circus performers and workers had to eat three meals a day. On the menu for the Marshalltown stay: chicken soup, roast beef gravy, stewed chicken, mashed potatoes, string beans, bread, cheese, apple pie and ice cream for dessert. Two train carloads of meat were brought in from Omaha—beef, mutton, and chicken. But most of the food was purchased from Marshalltown businesses. W.J. Conway was responsible for lining up supplies. He came to town a couple days before everyone else. One thousand pounds of bread, 350 pies, 100 gallons of ice cream, 500 pounds of coffee, 55 gallons of milk, 80 bushels of potatoes, 800 pounds of butter, and 400 cantaloupes. And that was just for the humans! In addition, Conway purchased 15 tons of hay, 1,000 bushels of oats, and 9 tons of straw bedding. The circus was a huge investment for the circus owners. Performers, workers, and animals filled 81 double-length train cars. There were over 3,000 costumes valued at $500,000. Canvas for 20 acres of tents had to be purchased. The wild animals were not cheap. The giraffe family consisting of dad and mom—Tom and Mary—and baby Harry were valued at $40,000. One elephant robe cost $12,000. A large contingent of employees had to be paid. Barnum & Bailey had 14 bookkeepers, three veterinary surgeons, an attorney, a postmaster and an official weather forecaster. The blacksmith shop employed 21 men, the wagon shop 12 and the paint shop 16. There were 60 ushers. Barnum & Bailey claimed they had $3.5 million invested in their circus and that it cost $7,500 a day to operate. Admission for adults was 50 cents; for children under 12—25 cents. But it was a small price to pay for the “greatest show on earth” brought by rail to Marshalltown, Iowa. “As usual, this year’s class was the best in history.” The newspaper reporter who covered the Centerville High School class of 1896 must have been a cantankerous, but seasoned writer. And he certainly had attended more graduation ceremonies than he cared to in his lifetime.